In the Year 1839, approximately 8 months after the Saxons, Pastor Grabau and his congregation in Erfurt emigrated to America. Amid his congregational members was also found the Prussian Artillery Captain H. von Rohr. The majority of these Prussian Lutherans settled in and around Buffalo, N.Y. Pastor Grabau recognized the lack of internal validity in a union between the Lutherans and the Reformists and recognized a particular trend towards the eroding of the old church order through the King's initiatives to bring about a union. The union agenda had also been forced upon him. When he and his congregation asked if they could practice one of the old agendas this was denied to them. For this reason he and other Lutheran pastors were suspended and put in prison. Under the yoke of persecution his congregation in Erfurt urged emigration to America, where one could have the hoped-for religious freedom. Pastor Grabau resisted this thought in the hope that freedom might yet be gained in Prussia for the Lutheran Church. As long as there was still hope, he maintained, it was wrong to leave. 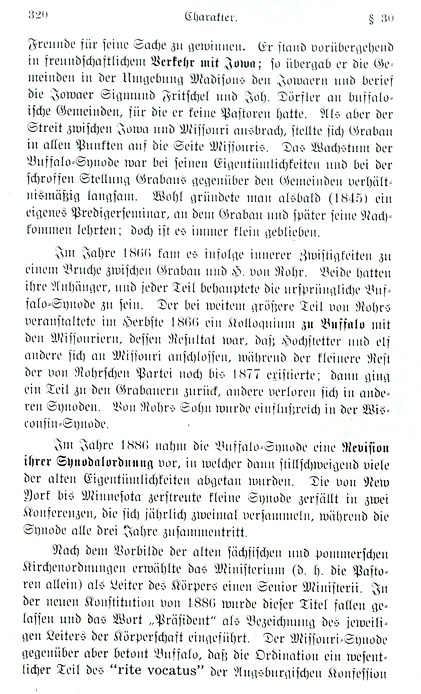 When the Lutheran Church asked King Friedrich Wilhelm III of Prussia for his indulgence and he responded in writing, telling them that he would tolerate the Lutheran Church only within the Union, Grabau himself decided to emigrate and he went in the Fall of 1839 to Buffalo, where the people settled. During his time of tribulation he came in close contact with the Lutherans in Pommerania and the Uckermark, who had gathered themselves around Pastors Ehrenström and Kindermann. They hoped that they too would emigrate. Then on June 7, 1840 (*) the King died. His son and successor, King Friedrich Wilhelm IV, did not agree with the prevalent church politics and after his coming to power he guaranteed the Lutheran Church certain concessions as a Church congregation. Consequently the emigration of the Lutherans out of Prussia came to a standstill. 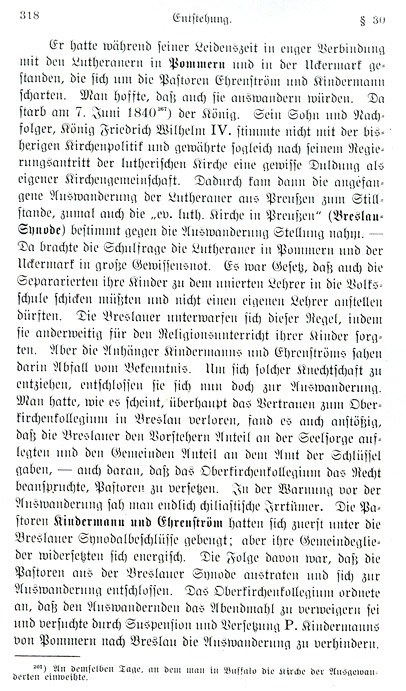 At that time even the "Evangelical Lutheran Church in Prussia" (the Breslau Synod) took a stand against emigration. The educational issue became a distressful matter of conscience for the Lutherans in Pommerania and the Uckermark. The law stated that the separatists must send their children to the teachers of the Union School; they were not permitted to provide for their own teachers to educate their children. 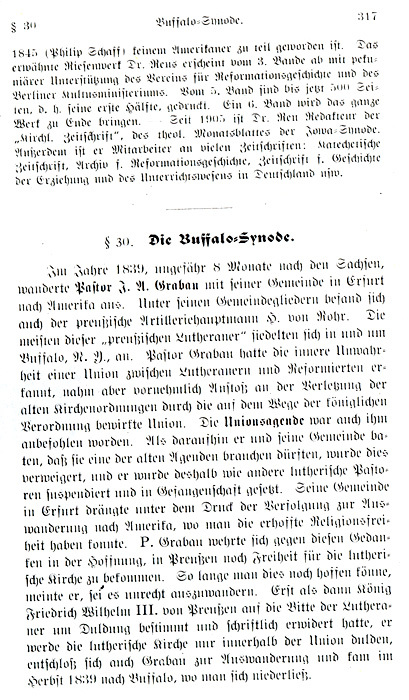 The people of Breslau submitted to this regulation while providing alternate means for their children's religious instruction. However the followers of Kindermann and Ehrenström saw this as an erosion of their religious confession. In order to cast off such subservience they now decided to emigrate. It seems the people had lost faith in the Upper Church College [the ecclesiastic administrators] in Breslau and they found it displeasing that the Breslau College was placing the duties of the administrators in the hands of the clergy and giving the congregation ministerial duties — they were also displeased that the Upper Church College claimed to have the right to transfer pastors. In the admonition concerning emigration people finally saw Chiliastic error. 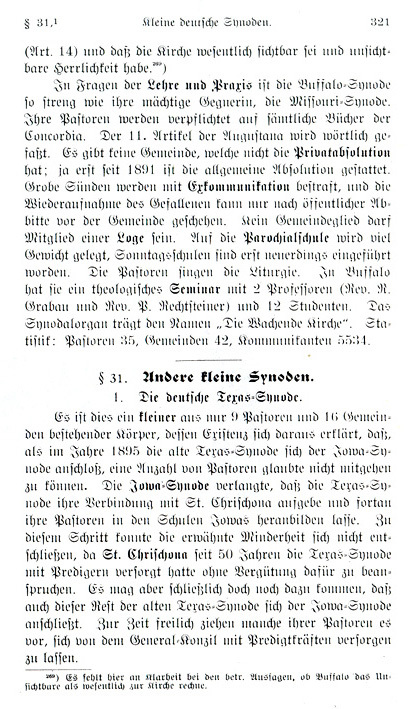 Pastors Kindermann and Ehrenström at first conceded to the Breslau Synodal Decree, but their congregational members vigorously opposed it. Subsequently the pastors left the Breslau Synod and decided to emigrate. The Upper Church College ordered that the emigrés be denied the Eucharist and it tried to impede the emigration by suspending Pastor Kinderman, removing him from Pommerania and transferring him to Breslau. But this congregation held fast. At the end of 1842 two emigrating congregations were formed. The Pommeranians traveled in many ships from Stettin to New York, arriving in September while the people from the Uckermark came to Buffalo via Hamburg. Ehrenström was arrested in Hamburg for his provocative sermons against the United Church and he was sent back to Prussia. He came back in 1844 **) — Pastor Kindermann and his Pommeranians settled in the woods not too far from Milwaukee. 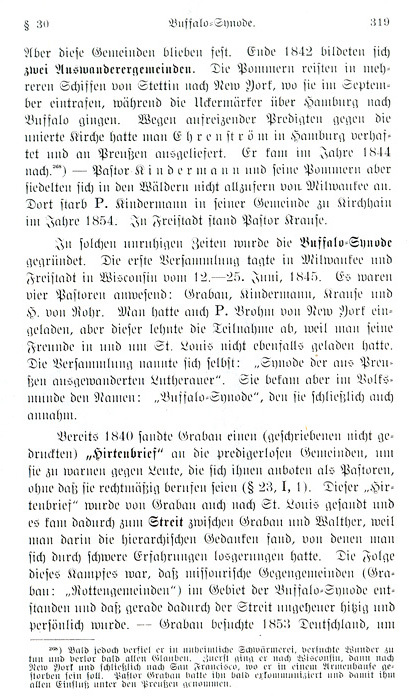 There Pastor Kindermann died among his congregation in Kirchhain in 1854. Pastor Krause resided in Freistadt. The Buffalo Synod was established amid such tempestuous times. The first assembly occurred in Milwaukee and Freistadt, Wisconsin from June 12 through 25, 1845. Four pastors were present: Grabau, Kindermann, Krause and H. von Rohr. Pastor Brohm of New York was also invited but he declined to participate because his friends in and around St. Louis had not been invited. 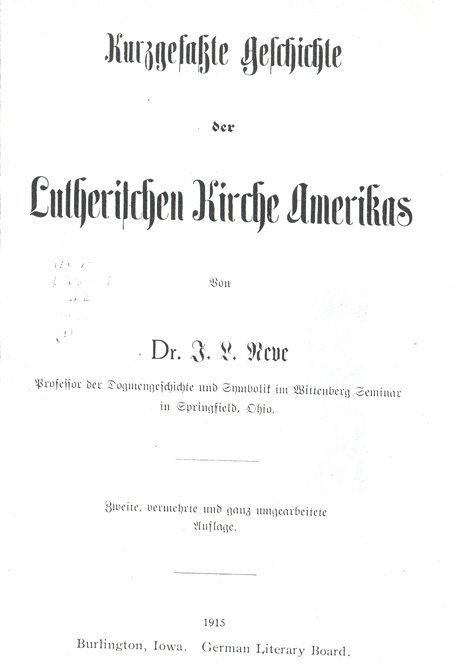 The assembly called itself the "Synod of the Immigrant Lutherans of Prussia". The common folk called it simply the "Buffalo Synod" and the name eventually stayed. in order to win friends to his cause. For a time he maintained friendly contact with Iowa; he placed the Iowans in charge of the congregations near Madison and appointed the Iowans Sigmund Fritschel and Joh. Dörfler to the Buffalo congregations, for which he had no pastors. But when the dispute between Iowa and Missouri erupted Grabau positioned himself fully on the side of Missouri. The growth of the Buffalo Synod was relatively small due to its peculiarities and Grabau's harsh attitude towards the congregations. Even though a seminary for ministers had been established (in 1845), in which Grabau and later his successors taught, the seminary always remained small. In 1866 inner turmoil resulted in schism between Grabau and H. von Rohr. Both had his followers and each group maintained it was the original Buffalo Synod. Von Rohr's far larger group held a colloquium in Buffalo with the Missourians and the result was that Hochstetter and eleven others joined the Missouri Synod. A small portion of the von Rohr contingent existed until 1877, at which time a portion of that group rejoined the Grabau sect while others joined other synods. Von Rohr's son was influential in the Wisconsin Synod. To the question of doctrine and practice the Buffalo Synod is as strict as its mighty opponent, the Missouri Synod. Its pastors are duty-bound to the collected books of the Concordia. 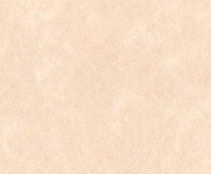 The 11th article of Augustana is observed by its literal interpretation. There is no congregation which does not have private absolution. Only since 1891 has a general absolution been established. Serious sins are punished with excommunication and the rejoining can only occur after the fallen publically apologizes before the congregation. No congregation member may be a member of a lodge. Much importance is placed on the parochial school. The introduction of Sunday schools is relatively new. The pastors sing the liturgy. In Buffalo there is one theological seminary with two professors (Rev. R. Grabau and Rev. P. Rechtsteiner) and 12 students. The Synodal publication carries the name "Die Wachende Kirche" [The Vigilant Church]. Statistics: 35 pastors, 42 congregations, 5534 communicants. ***) Clarity is lacking here in the respective declaration whether Buffalo considers the invisible essential to the church.